The Delegate type represents a delegate in C#. Delegates in C# are used to invoke methods at runtime. A Delegates in .NET can be a singlecast delegate or a multicast delegate. This tutorial with code examples explain how to instantiate a delegate, reference a delegate, and call a delegate in C# and .NET. Delegates and events are a fundamental concept yet complex in .NET and C# language. This article explains basic concepts of delegates and events and how they are used in a .NET and C# application. Delegate in C# is similar to a function pointer in C or C++. It's a new type of object in C#. Delegate is very special type of object as earlier the entire the object we used to defined contained data but delegate just contains the details of a method. Programmers often needs to pass a method as a parameter of other methods. For this purpose we create and use delegates. A delegate is a class that encapsulates a method signature. Although it can be used in any context, it often serves as the basis for the event-handling model in C# and .NET. One good way of understanding delegates is by thinking of a delegate as something that gives a name to a method signature. Any method that matches the delegate's signature, which consists of the return type and parameters, can be assigned to the delegate. This makes is possible to programmatically change method calls, and also plug new code into existing classes. As long as you know the delegate's signature, you can assign your own-delegated method. This ability to refer to a method as a parameter makes delegates ideal for defining callback methods. In class we create its object, which is instance, but in delegate when we create instance that is also referred as delegate (means whatever you do you will get delegate). Delegate does not know or care about the class of the object that it references. Any object will do; all that matters is that the method's argument types and return type match the delegate's. This makes delegates perfectly suited for "anonymous" invocation. In simple words delegates are object oriented and type-safe and very secure as they ensure that the signature of the method being called is correct. Delegates makes event handling simple and easy. There are two types of delegates, singlecast delegates, and multiplecast delegates. Singlecast delegate point to single method at a time. In this the delegate is assigned to a single method at a time. They are derived from System.Delegate class. When a delegate is wrapped with more than one method that is known as a multicast delegate. In C#, delegates are multicast, which means that they can point to more than one function at a time. They are derived from System.MulticastDelegate class. To create a delegate, you use the delegate keyword. Because a delegate is a definituon for a method, you must use parentheses, required for every method. If this method will not take any argument, leave the parentheses empty. The above code is how a delegate with no papameters is defined. The above code shows how a delegate is initiated. The above code piece invokes a delegate d1(). Here is a sample code that demonstrates how to create and use a singlecast delegate. Here is sample code that demonstrates how to create and use a multicast delegate. Delegate gives a name to a method signature. Delegate helps in code optimization. The most common example of using delegates is in events. Delegates are also used for generic class libraries, which have generic functionality, defined. You can create a delegate, but there is no need to declare the method associated with it. You do not have to explicitly define a method prior to using the delegate. Such a method is referred to as anonymous. In other words, if a delegate itself contains its method definition it is known as anonymous method. The code is an example of using an anonymous delegate. Note: You can also handle event in anonymous method. Events and delegate work together. An event is a reference to a delegate i.e. when an event is raised, a delegate is called. 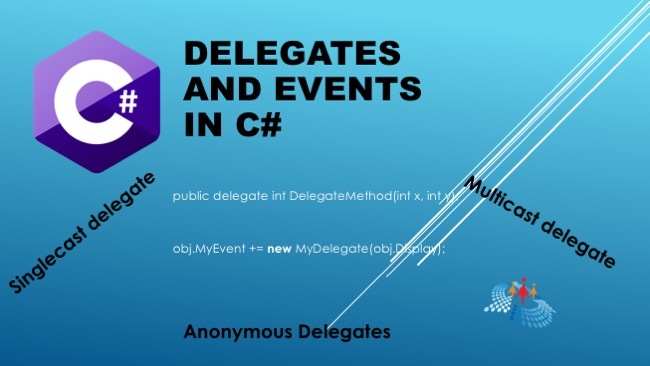 In C# terms, events are a special form of delegates. Events play an important part in user interfaces and programming notifications. Events and delegates work hand-in-hand to provide a communication between code from one class to other class. When something happens in one class or one part of the code and other part of the code needs a notification, events are used. A C# event is a class member that is activated whenever the event it was designed for occurs. It starts with a class that declares an event. Any class, including the same class that the event is declared in, may register one of its methods for the event. This occurs through a delegate, which specifies the signature of the method that is registered for the event. The event keyword is a delegate modifier. It must always be used in connection with a delegate. The delegate may be one of the pre-defined .NET delegates or one you declare yourself. Whichever is appropriate, you assign the delegate to the event, which effectively registers the method that will be called when the event fires. How to use events in C#? An event has the value null if it has no registered listeners. Although events are mostly used in Windows controls programming, they can also be implemented in console, web and other applications. Hope the article would have helped you in understanding delegates and events. Here is another recommended article on Delegates in C#.